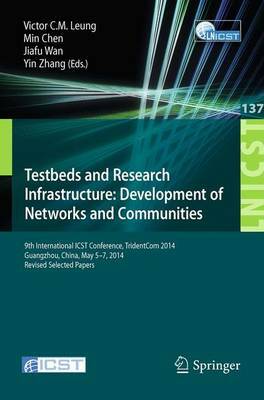 This book constitutes the proceedings of the 9th International Conference on Testbeds and Research Infrastructures for the Development of Networks and Communities, TridentCom 2014, held in Guangzhou, China, in May 2014. The 49 revised full papers presented were carefully selected out of 149 submissions. The conference consisted of 6 symposia covering topics such as testbed virtualization, Internet of Things, vehicular networks, SDN, NDN, large-scale testbed federation, mobile networks, wireless networks.